How are their heritages represented in your archives or local history rooms? 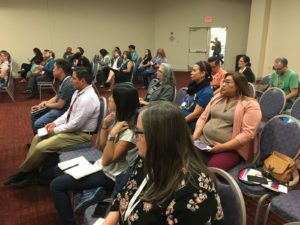 We heard from several attendees including Madeline Peña from the Los Angeles Public Library who described the photo collection, “Shades of L.A.” where outreach was conducted with the public for photo donations from Los Angeles. In our discussion, we realize that we can all acknowledge issues that exist with our collections. Both Michelle and Lalitha formerly worked at the Escondido Library and recognized the collection was not representative of the community groups in archives. Voices were unheard. It didn’t help that at the time of this initiative that the political climate was in flux. Marginalized communities were feeling unheard and unrecognized. As a daughter of immigrants, Michelle knew this project would be challenging and an emotional connection. We are erasing people and that is not the purpose or core of preserving and recognizing our communities. Michelle looked for guidance in approaches, frameworks, and partners to develop the Home program and library services with archives seemed like a great fit. She recognized that whatever the end result would be that would not be able to use traditional practices. 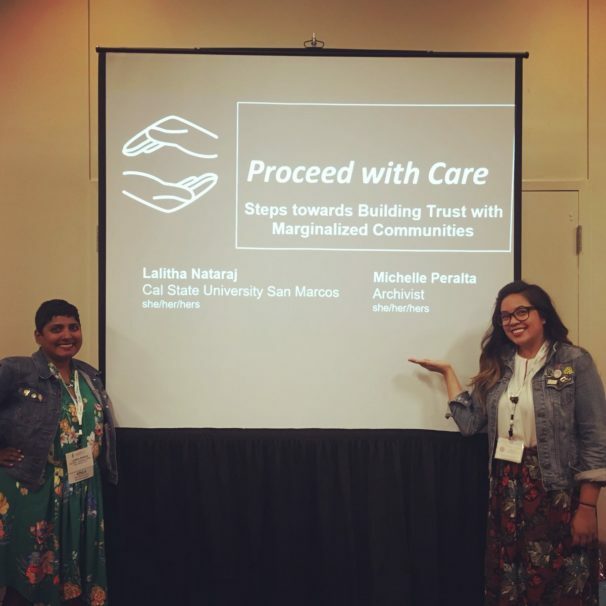 They decided to use the feminist ethics of care approach, as this project would entail developing and gaining the trust of marginalized communities. The framework of participatory archives also was used but with application. Michelle approached Lalitha to partner. They used funds from a California Library Literacy Services grant in order to develop this project. Home offered learners a place to share their stories. The Escondido Public Library Literacy program was eager to partner. There were many issues and concerns that came up during the development of the program. For example, they had to get approval and buy-in from representatives within the library and archives. Home: A Living Archive is a photo and narrative collection where individuals were invited to share their stories. While gaining trust takes time, this was a beginning to develop trust with marginalized communities. What are the next steps you may ask? While the program was successful with an exhibition in November and an aggressive timeline, it is yet to be seen what next steps there are for this initiative. The Home project was going to be a digital exhibition but it is not yet available on the Escondido Public Library website and both presenters have since moved to different institutions. The hope is that this project will continue and lead to a larger recognition and initiative within the community.